How can Social media marketers use the new Twitter hearts for even more engagement? Confused what might the Twitter hearts mean for you? To save Tweets (using IFTTT) to your pocket account or evernote. To collect testimonials from your followers. To send a tweet to their buffer Que. Get more engagement on your tweets because, unlike the stars, likes add more the the emotional quotient of what you’ve got to say. The official tweet announcing the twitter hearts says, you can use the hearts to say LOL, congrats, adores, love, yes!, stay strong etc. Personally, I like the twitter hearts option more than the dead boring look of the favorite star. The hearts along with their visual effects add more to the freshness of Tweeting. How to bring back the Twitter favorite star option? Want the stars to replace the hearts? 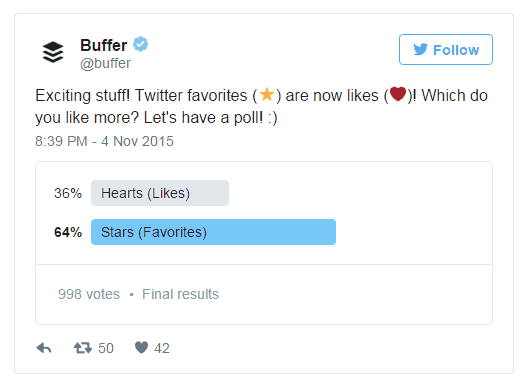 In a poll conducted by Buffer team, Twitter users clearly show more love for the stars than the hearts. You can, however, bring back the old twitter stars option by replacing hearts using a plethora of chrome extensions. Adding chrome extensions to restore the old twitter stars will enable you to use the same old twitter. Twitter old favorite can replace the new twitter heart option with the old yellow stars. If you have thousands of tweets on a single page it might take some time to restore the stars but will do it effortlessly. Just another plugin to get your twitter star back. This plugin was amongst the first few that were thrown after the news of twitter hearts broke. The developer was honest enough to admit, its his first extension an might somewhere o wrong. So use it with your own conscience. Fav forever promises to bring back the stars that were killed by twitter hearts on 3rd Nov 2015. 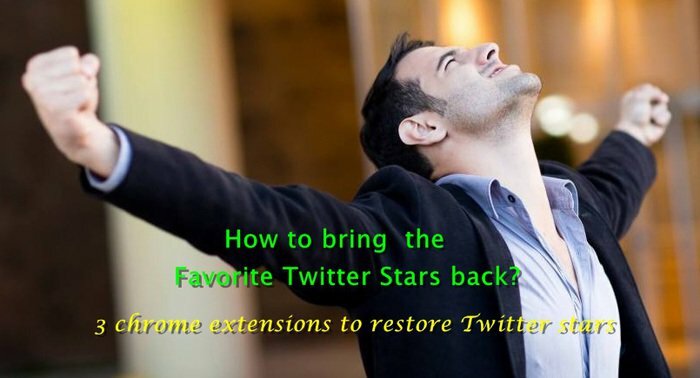 This extension lets you get your twitter star back and live in the gone era. Here are a few things you should always consider before removing twitter hearts. Some of these chrome extensions are by new developers and might be buggy. The twitter stars appear only to you rather than everyone of your followers. You can experience the good old stars only when you log in Twitter through chrome browser. How do you like the new Twitter hearts? Are you going to replace your twitter hearts and likes with old stars and favs? I guess hearts are twitter’s way of saying we now are more user friendly and appealing to a huge user base. How are you going to use Twitter hearts for marketing? Write your valuable thoughts in the comments below. 9 tips to increase your Facebook likes and shares. 3 tips to get people to like you online.